Whenever I see The Hierophant Tarot Card come up in a reading, I know a life lesson is getting ready to be shown in whatever area is needed. Depending on what cards are supporting the Hierophant, it usually means that a drastic change in a life situation is or has come about to teach growth, spiritual awareness, self-love and self-esteem but it also represents that the healing for this situation will also be available. It is definitely a tarot card that indicates whatever is going on in your life is trying to teach you to be more than what you are at the moment. Some readers interpret this card as representation of established institutions and a warning not to buck the system. I prefer to see this card as just the opposite of that impression but every reader has their own unique way of making sense of this card within the reading. The Hierophant Tarot Card can also represent the spiritual teacher who helps us come into contact with the Divine. Unlike the Magician, who simply points the way, the Hierophant is a trusted guide, one who will take us by the hand and lead us to our spiritual goal of awakening. He represents a gateway to a higher consciousness reached in a ritualized manner. He teaches what can be learned by word and example. The Hierophant is very much about “doing the right thing.” You may be struggling with an issue and are unsure about what is “right” for you to do. This card reminds you that the answers are within you. Remembering that the “right” thing is what is right for you also. Where career is concerned, you may find that a teacher or mentor of some sort that you have been needing appears in your life now…and/or you could be called upon to be that teacher or mentor for someone else. This is a good time to get involved with groups even if you don’t think of yourself as a “group person,” as you will find that you have much to learn from them (in a very positive way.) This usually represent that work should be going very well provided you are able to be organized and work within the rules. Romance also is likely to be going very well, as long as you stay within the traditional rules of a relationship. “Buck the system” or start acting outside the boundaries of what is expected of you in a relationship, you will usually have some hard lessons in love to learn. 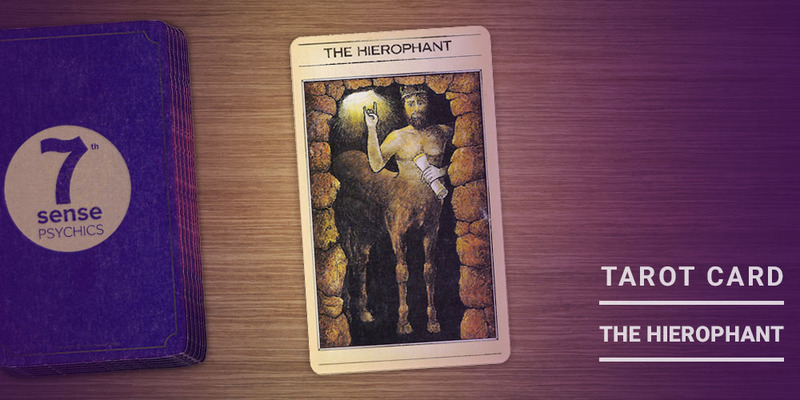 When it comes to finances, The Hierophant Tarot Card usually is a heads up that it is time to play by the rules and to use down-to-earth, normal, traditional ways to handle your money. Seeking the advice of bankers and professional money managers and/or people with more experience dealing with money than you have. This is not a good time for taking chances with your money or being extravagant. If you have health challenges, discipline, order, and commitment in whatever way that makes sense to you is the answer. “Traditional” therapeutic means also have a high chance of success now. It can also represent a time to re-teach yourself to be healthier in your overall everyday approach to eating, exercise or stopping over indulgence. If you are strongly pursuing spirituality (even if you don’t have anything approximating a “traditional” religious belief), then the Hierophant urges you to quiet yourself and allow your spirit time to expand. What matters here is the regularity of it, whether it’s meditation, reading spiritual books, listening to positive affirmation tracks or just quiet moments, make it daily, weekly or whatever you can make time for. You will see changes in your life and outlook as a result of giving yourself this awakening time. I particularly have always liked seeing this card in a reading spread. It shows to me that the person I am reading for is ready to grow spiritually and their perception of their life is also getting ready to expand. It usually culminates in a ‘raising of the bar’ effect in what you thought you wanted in life, love and career. Resistance of that growth is always futile. Thank you for this reading I absolutely love it!